These poignant trailing lines from a poem of the Ghanaian poet Kofi Awoonor came to my mind when I heard of the passing of Francis K. A. Allotey, the most important theoretical physicist to have come out of Ghana and Africa in the twentieth century. When a giant tree has fallen in the village, it signifies the end of an era, the passing of an age. The span of the intellectual age ushered in by Francis Allotey, measured by the consultant deities, has come to an end. His legacy is the springing of a new grain ushering in a new intellectual era in the African scientific milieu. I wish to reflect on his intellectual legacy. Francis Allotey was born in 1932 in Saltpond of the then British Gold Coast a Crown Colony, which had no universities then, a situation common in much of Africa of the time. He was born in a world of intense racial strife, virtually all Africa locked in the rigid seemingly permanent embrace of colonialism and perceived intellectual servitude. It was a world on the cusp of violent political turmoil. It was the world of the Great Depression, the seemingly inexorably rise to power of the Nazis in Germany, virulent militarism in imperial Japan, crash course industrialization at tremendous human cost in Stalin’s Soviet Russia, massive despair and economic devastation in Depression ridden America and increasingly evident military preparations by the Great Powers to once and for all resolve the contradictions left unsettled by the Great War of 1914-18. But it was also a world of exciting science. The electron microscope had been invented in 1931, Linus Pauling develops the theory of chemical bonds. Enrico Fermi in 1932 achieves the first fission of uranium which is firmly confirmed by the experimental results in nuclear fission by Otto Hahn and Fritz Strassman in 1938. The neutron is discovered by Chadwick in 1932 expanding our understanding of atomic structure. The theory of the nuclear force is developed by Hideki Yukawa who in 1935 working in his native Japan predicts the existence of mesons. Pyotr Kapitsa in 1938 discovers superfluidity a characteristic of fluids that flow without loss of kinetic energy. Superfluidity would later lead to tantalizing theories involving quantum gravity and the standard model of particle physics. All these discoveries and books on the lives of outstanding scientists, as the world woke up from its descent into the mass psychosis of 1939-1945, would percolate through the expanses of the British Empire and find their way to the town of Saltpond on the shores of the Atlantic Ocean in the small British colony of the Gold Coast. In this sleepy town, Francis Allotey’s father was a humble bookstore owner and books on the exciting developments in the world of science made their way on a seemingly preprogrammed trajectory to his bookstore to meet the febrile mind of the young Allotey. Thus spake Allotey’s fate as decided by the consultant deities. He was enrolled at the Ghana National College a new secondary school established in 1948 by Kwame Nkrumah, Ghana’s first post-independence leader. Allotey was sixteen years old at the time, being among the very first batch of students enrolled at the new school, which he completed at the age of nineteen. He then proceeded to the UK to the London Borough Polytechnic where he completed the preparatory courses and then enrolled in Imperial College which he successfully completed in 1960. He would then proceed to Princeton University to the famous Palmer physics laboratory where he would earn his Masters and PhD degrees by 1966. The Palmer laboratory was a place where leading mathematical physicists would collaborate with the distinguished mathematicians and physicists at the Institute of Advanced Studies and with the mathematicians in Fine Hall where the math department was situated. It is in this deeply stimulating and rarefied atmosphere that Allotey would come of scientific age and publish a ground-breaking paper in soft X-ray spectroscopy on the effects of electron-hole scattering resonance on X-ray emission spectrum. The flavor of physics in which Allotey wrote his paper was very exciting. The 1950s was a period of intense investigation of nuclear size and structure by Robert Hofstadter and others who with their work on the scattering of electrons from atomic nuclei gave the world of science a deeper knowledge of nuclear size and the distribution of charges in atomic nuclei. The scattering of electrons in atomic nuclei has been the key to our understanding that protons and neutrons are fermionic particles made up of the u and d quarks (quarks are elementary particles) with protons having a structure made up of two u quarks and one d quark (p=uud) and neutrons made up of two d quarks and one u quark (n= ddu). Therefore, when Allotey arrived at Princeton in the early 1960s, research in electron-hole scattering was a very hot area of physics, at the very cutting edge of the frontiers of physics in which the young man from Saltpond would be destined to play a significant role. Let us talk briefly about what X-ray spectroscopy and X-rays are. We know from basic physics that X-rays are electromagnetic radiation that are emitted from atoms of relatively low atomic number when electrons in those atoms jump from an outer shell to an inner shell in which a vacancy has appeared. The characteristic energies of these X-rays are related to the atomic number of the element. Therefore, every element has a characteristic X-ray spectrum. This means that by studying the X-ray spectrum of various elements, we can understand the structure of the element. The spectrum of the X-rays has a regular profile meaning that the X-ray lines (spectrum) can be arranged into various families of types K, L and M. This was established by H. G Mosley in 1913. Due to the regular structure of the X-ray spectrum, Mosley could resolve the inconsistencies in the placement of Cobalt vs. Nickel in the periodic table and Argon vs. Potassium in the periodic table. Prior to his work, the placement was decided by atomic weight which was not an accurate method as it produced inconsistencies. He was also, based on the X-ray spectra, able to predict the existence of new elements in the periodic table. When Allotey started his research work in Princeton in the 1960s, the K family emission spectrum of Lithium had a feature that no one understood and which could not be explained. Allotey came up with a theoretical formalism that could explain the features of the K family emission spectrum of lithium. But more importantly, his theoretical formalism predicted the features of the unobserved emission (in the L family) of sodium. Initially his elegant theoretical formalism was met with disbelief by the physics community but his triumph came with experimental confirmation of his work. 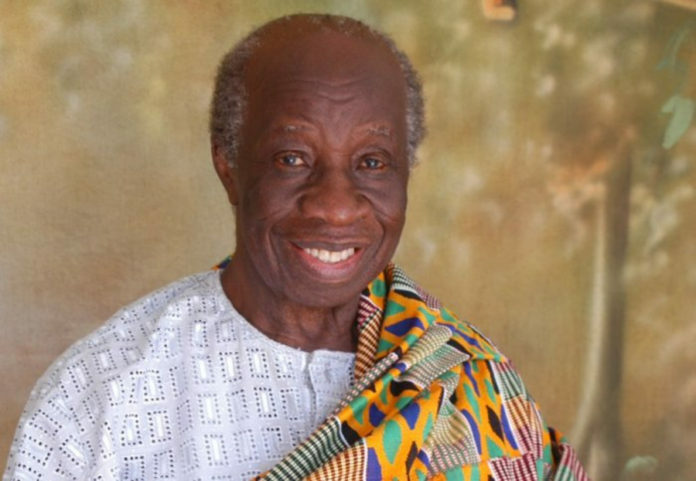 After 1966, Allotey established himself in the ranks of world class physicists and more importantly brought modern Africa into the rarefied field of world class science. This was barely eighteen years after the first modern university was founded in Ghana in 1948. Following such brilliant work, he could have chosen to stay in the West where a comfortable career awaited him. But Allotey chose to return to Ghana, a post-colonial country in the throes of political storms following the overthrow of Kwame Nkrumah. It was a remarkable and patriotic decision motivated by his desire to bring modern theoretical physics to Africa. He would contribute immensely to the establishing of a strong tradition of mathematics and theoretical physics in Ghana and in Africa at large. He also established the first computer science department in Ghana, showing the expansive breadth and depth of his intellectual powers, and thus ushering Ghana, among the very first countries in Africa, into the computer age. Apart from his work in theoretical physics, he also wrote papers in the purer areas of mathematics like functional analysis, operator theory. His friendship with distinguished mathematicians like Sir Michael Atiyah of the famous Atiyah-Singer index theorem that connects the dimension of the space of solutions of an elliptic differential operator on a compact manifold to the topological index, contributed to the establishment of the African Institute of Mathematical Sciences AIMS -Ghana branch as a center of excellence in graduate and research level mathematics in Ghana and in Africa. In his later years, he would continue to gain international recognition and working tirelessly to expand the culture of research at the highest levels in mathematics and physics. I had the occasion to interact with him at math conferences at the Ghana Atomic Energy Commission when I was a young man playing in the abstract world of mathematics. He was brilliant beyond measure with such an unassuming manner which put everyone at ease, irrespective of his achievements in physics, particularly in soft X-ray spectroscopy. Allotey, rest in peace as you journey to the ancestors to occupy your rightful place on the Osirian heights of scientific genius and raw brilliance. Africa salutes you and young eager minds are rising to take up the torch you have left behind. Na Zor Nyuie (Have a wonderful journey into the world of our great ancestors). Allotey would be pleased to read this eulogy of his fine accomplishments in mathematics and science. Nice to see all he has achieved and may he Rest In Peace. He sounds like a very brilliant man. Me? I didn’t go to college so I don’t understand a word of quarks or spectroscopy. But I turned out ok. Guess you don’t need the fancy stuff sometimes so long as you know to rub sticks to make a fire, fetch water, and catch fish. Yes, a very well deserving tribute by Brother Jehuti to an Afrikan giant of Science! The most fitting honour that must be done to such Sages is to train New Breeds of intellectual pathfinders to continue blazing their heroic trails in the best interests of Afrika and all Humanity!